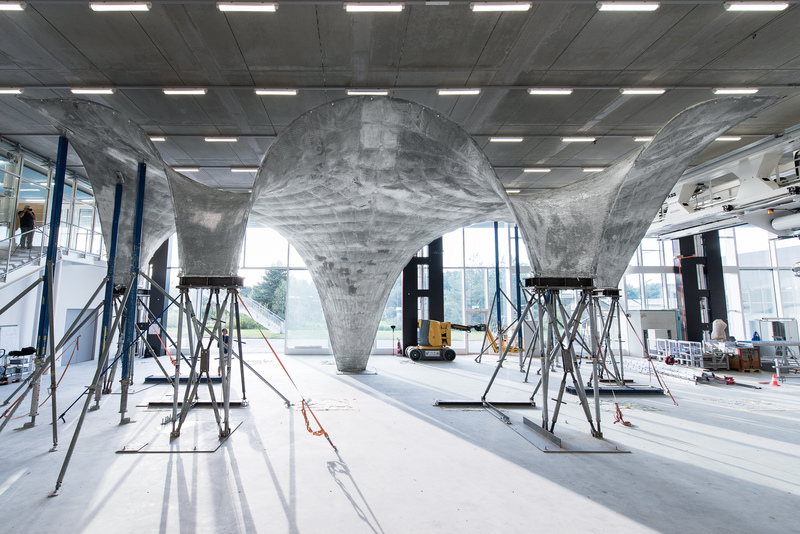 The Block Research Group (BRG) and supermanoeuvre completed a full-scale prototype of the NEST HiLo, flexibly formed, thin shell concrete roof at the Robotic Fabrication Lab of the Institute of Technology in Architecture, ETH Zurich, Switzerland. NEST HiLo is a joint project of the BRG, the Chair of Architecture and Building Systems, and supermanoeuvre. For the preliminary and final design phase from 2013 to 2015, the team also included Zwarts & Jansma Architects (ZJA). During those same phases and while at the BRG, Summum Engineering’s Diederik Veenendaal, served as project coordinator for NEST HiLo successfully obtaining a building permit and as structural engineer to parametrically model and structurally optimize the roof, in collaboration with Jack Bakker from ZJA, and under supervision of Prof. Philippe Block from the BRG. Read more on our project page of NEST HiLo, the BRG’s project page, the BRG’s project page for the prototype, the university’s press release for the prototype.